Debbie Major swaps the jam and almond sponge layers with marmalade and coconut creating a new twist on the classic bakewell tart recipe. For the pastry, sift the flour, a pinch of salt and the icing sugar into a food processor. Add the butter and orange zest, then whizz briefly until it looks like fine breadcrumbs. Beat the egg yolk with the orange juice, then add to the food processor and pulse briefly until the mix startsto clump together. (If you don’t have a food processor, you can do this by hand in a mixing bowl, rubbing in the butter with your fingertips, then mixing in the liquid with a wooden spoon.) Turn out onto a lightly floured surface and knead briefly until smooth. If the pastry is very soft, chill it for15 minutes first. Roll it out until 3mm thick and use to line a buttered 12cm x 35cm metal tin (see tip). Prick the base all over with a fork and chill for 20 minutes. Heat the oven with a baking sheet inside to 200°C/fan180°C/gas 6. Line the tart case with crumpled baking paper and fill with baking beans or rice. Bake for 15 minutes. Remove the paper and beans/rice, then bake for 3 minutes more or until crisp and light brown. Remove and set aside. Turn down the oven temperature to 180°C/fan160°C/gas 4. For the filling, use an electric hand mixer to beat the butter and sugar together in a bowl until light and fluffy. Beat in the eggs one at a time, adding 1 tbsp flour with the second egg. Using a metal spoon, gently fold in the ground almonds, desiccated coconut, the remaining flour and the orange flower water. Spoon the marmalade over the pastry base, then top with the filling and gently spread it to the edges. Bake for 30 minutes until puffed up and golden, and a skewer pushed into the centre comes out clean. Remove the tart from the oven and leave to cool for 10 minutes to serve warm, or leave on a wire rack to go cold. 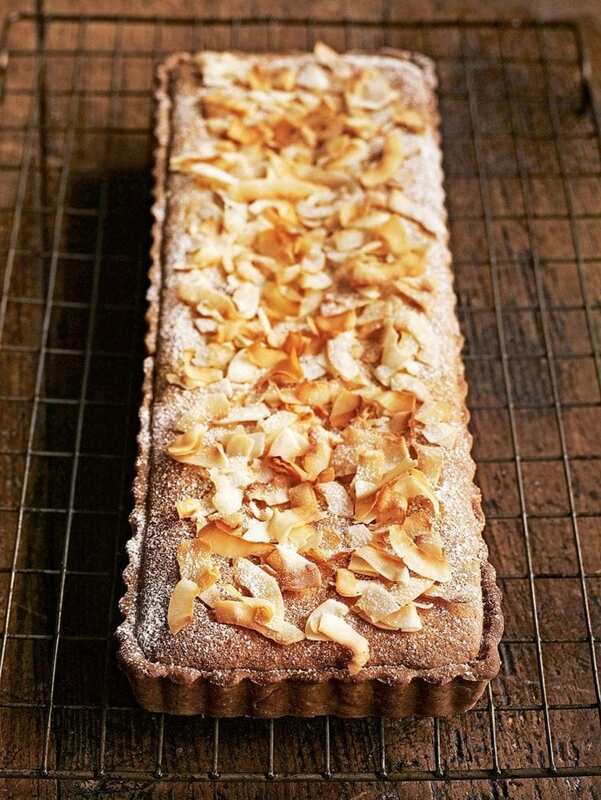 Scatter with the toasted coconut, dust with icing sugar and cut into slices to serve. Silverwood makes rectangular tins (fluted tranche tins). Find them at John Lewis or on amazon.co.uk. You could use a round 23cm tart or cake tin with a removable base instead. The cooking time will be the same. Make the pastry case in advance and either keep in a container for up to 2-3 days or freeze for up to one month in its tin, well wrapped in clingfilm. Do Seville oranges make the best marmalade?